Thank you all so much for joining me for the 7th annual Final Countdown! It’s always more motivating for me to do the tasks, knowing that you all are doing them right along with me. I’m halfway through reorganizing my fabric stash. I’m not quitting on it till it’s done this time. I’m going to keep working on it a little each day, and I hope to have the bulk of it organized well before the end of January. I drug out and reorganized a bunch of UFOs. I got rid of some completely — reorganized some others; and some I haven’t gotten to yet. But I’m not quitting on that, either. I updated my list, and I started out at 96, but now realize I have 110 of them, and 28 of those are simply waiting to be quilted. We’ll see if I can reduce that number drastically by the end of the year — somehow — I’ll be keeping you updated! My friend, Lori, has vowed to finish 55 quilts this year, the same as her age. I told her I might try it along with her, and I’m sure glad I’m younger than she is — hahaha! As for stepping outside my quilty box, if you saw my post on the 1st, I’ll be doing a year’s worth of creativity challenges, intended to make me try lots of new things. Some of you have already said you’re joining me, and I’m really happy about that — I think it’s gonna be a lot of fun! So now . . . about those prizes! I’ve randomly drawn three names: Kathy F., Deanna, and Michele! Thanks so much to everyone for playing along, and we’ll do it again at the end of this year! Meanwhile, the new year of organizing tasks started today, so you can keep up with those until then, right? Wow, 55 is a lot to finish in a year! I started the year with 25 and I’m down two so far. The next one is going to be huge. Was hoping to sandwich it today, but that didn’t happen. Congratulations to the winners!!!!! I got a lot done related to organizing and purging. 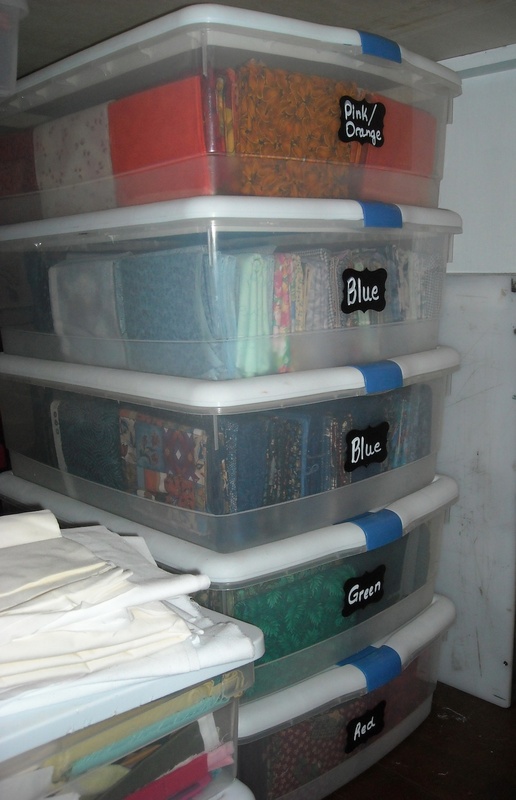 Glass front cabinets that were stuffed with fabric now hold my precuts and kits with lots of room to spare. 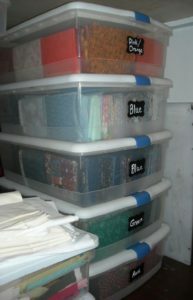 I reorganized some of the remainder, and reduced four bins of scraps to one, and plan to give the rest to Kevin the Quilter. I identified the projects I want to complete this year, and they are stored in view under the cutting table. All my other fabric fits on two six foot by four foot metal shelving units, including backings and some batting. I have a box of fabric to donate to HFQG for Veterans and community service quilts. My tops are on hangers in the closet waiting to be quilted, and quilts that need binding are stacked on a shelf. I still need to refold some fabric, and clean out and organize some drawers. I also want a different way to store my longarm thread. Now I need to get going on finisht those projects. Whoo-woo! I am so happy. Thanks mostly for the motivation and my nicely clean and tidy sewing room, but an extra prize is nice, too. HOORAY! Congrats to the winners! You all have inspired me. I might just actually join you this year. Of course I say that TODAY…and my workspace is a mess. It may well still be a mess all year. As for my 55 finishes this year…please bear in mind that many of those are all but done. I have a big stack of quilts that only need binding, and some are small things. Some are also knitting projects. On the downside, I pulled out a project yesterday that I THOUGHT was all but done but found out that the top is not even all together yet. I hadn’t worked on it in so long that I thought I was further along than I am (and it’s huge). Ah well, a finish is a finish is a finish, right? Anyway, I am proud of all of you organizers! Hope to be among you next year at this time. Just now starting my reorganization and clean out of my sewing room. I have never counted my WIPs and I’m a bit afraid to do so. I am going to send two quilts out to be long-arm quilted and so I have to piece the backs which is probably the part of quilt-making that I love the least. I think I’ll make that a 1st quarter goal. Thanks for all the inspiration, Shelly and everyone else. I know I’m late, but you inspired me to get organized and I did it! Well, I’m almost done, but I did blog about it here: http://vesuviusmama.blogspot.com/2016/01/the-skeletons-in-my-closet.html. Looking forward to following you throughout the year.